My sonos speakers have been working flawlessly with deezer up until this week or so. Now i have every song skipping after about a minute or so of play, regardless of it being flow or from a playlist. 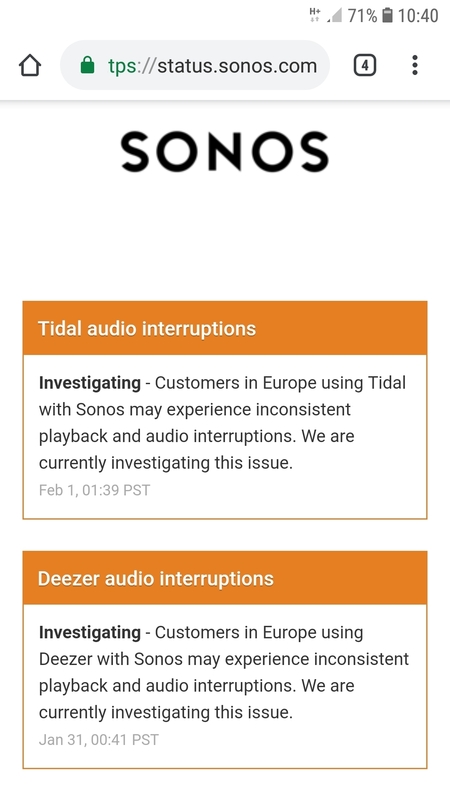 Sonos app just says "lost connection to deezer"
Update. So my issue of skipping only seemed to occure when I requested Alexa to play the music in the dining room via my Sonos beam in the lounge. Called Sonos and they advised to go to my Alexa app. Go to the skills section. Disaasiate the deezer skill. Leave for 30 seconds or so. Then re learn the deezer skill. This, for some reason, seems to have solved my issue. Very similar for me. Tried to find a solution (basically reset router box/check for updates) and it's still happening. Not all songs mind you, and of those that it does could be at any point within the song. Ive tried playing it through an iPad and my phone - Huawei. I have got the exacte same issue since a couple of days. Problems occur on every device, Iphone, Mac and iPad. Other music services work just fine. I have the same problem, not just through Sonos, also Google home. Happens whether I use phone or tablet. Sometimes the song gets half way through sometimes only 10 seconds. I had the same problem briefly a few weeks ago but it sorted itself out after a few hours. This time I haven't been able to use Deezer for last 2 days. Very annoying. I use a samsung a6+. Nobody on my account is using my profile. Thuis probleem starten last week. Using the sonos alsof. I love Deezer, but lately I’ve been playing music on my Sonos speakers, and every single song cuts out 10-20 seconds early before the end of the song. Then the next song in the playlist comes on and will do the exact same thing. Has anyone else seen this? It is very annoying and I can’t use Deezer on Sonos until it is fixed. This had just started happening to me in the last couple of weeks. It only happens with Deezer (I have the premium service). I have tried from Apple Music and it is fine. I tested it multiple times, every Deezer song cuts off early and all the Apple Music play through. On flow or using Deezer through the Sonos queue. I like the features of Deezer which are better then Apple Music but this is really annoying and if I can't find a solution I will have to switch services. I have the same problem which started 2 or 3 days ago. Songs skipping on all Sonos devices. Unusable service which is very frustrating. I’ve just tried this - didn’t help! Same issue persists. Very frustrating. Just did it. Used the windows app to change password, opened my phone app to see if it would register that it needed a new password (which it did). Had my sonos speekers off for at least 4 full minutes before i turned them on again, and then i went in the sonos app, removed the Deezer account completely and added it from scratch. Put on a playlist that i know for a fact has worked prior to this issue, and that has been skipping almost 100% of the songs. 4 skipped (barely 20 seconds in to the song). 5 almost made it through, but skipped about 1 minute before the end. As I mentioned in my previous post the problem does not occur solely with Sonos so there is no issue with Sonos recognising my Deezer subscription. Also if this was the problem it wouldn't play any of the track. I have successfully used Sonos with Deezer for the past 3 years up until now. The problem needs to be addressed looking at Deezer as at the moment the service is unuseable. Thanks for some of you who tried the troubleshooting. You're right, it seems that there's an issue but our developers are already working hard on it. I'm also raising more awareness by reporting all users commenting here to show the impact this has had on all of you. We also need to establish if there's anything going on with Sonos. Does this happen with any other device/web? I received this response from Sonos. "Unfortunately we are currently experiencing an Outage with Deezer, leading to the issues you have described." Is there a problem with Sonos and IOS ? Deezer keeps disconnecting and jumping tracks ? No full songs playing on Sonos via Deezer. 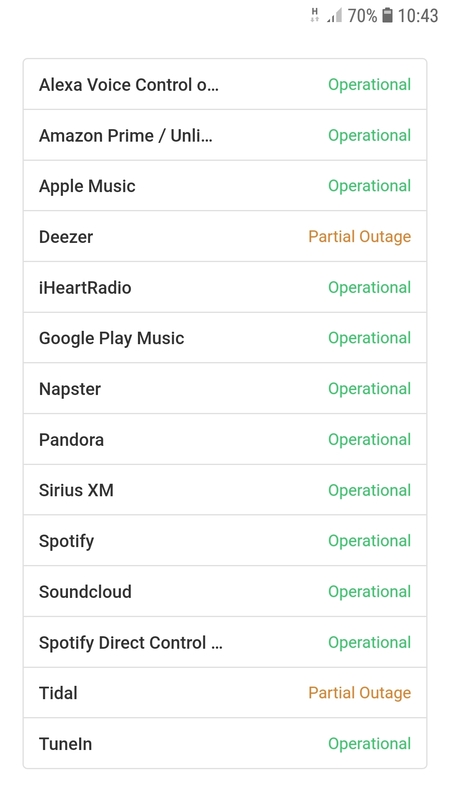 All other services on Sonos working fine. How long do you think it's going to be out?